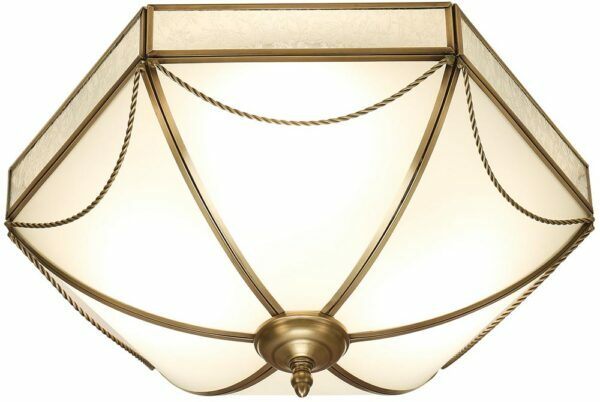 The Russel frosted glass Art Deco style flush 3 light in antique brass features solid brass trim and curved frosted glass, a wonderful bright and airy ceiling light in the period style. With a concealed flush mount supporting an inverted hexagonal curved glass shade. The rim has an antique brass trimmed panel, inset with etched glass. Each glass panel is trimmed at the edge in anique brass and features a curved rope decoration and lower finial. The Russel frosted glass Art Deco style flush 3 light in antique brass, part of the Rochamp collection of solid brass light fittings. Made entirely by hand using traditional sand casting techniques passed down through generations. The parts are then polished before being patinated to give an aged look.